* Mid-week Special: Noon Monday to Noon Friday (except holiday weekends). Refrigerator will be chilled upon your arrival. Stove fuel, paper products and cleaning supplies are provided. Charter fees are subject to Sales and Amusement Taxes (11% total). Group rate upon request. 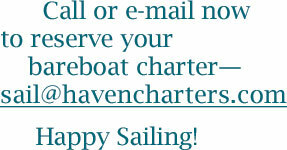 Multiple charter discounts. Rates shown have been discounted 3.5% for non-credit card transactions. Rates subject to change without notice. Mast Height — 54' 6"